This post describes the solution to a hibernation issue I had with Lenovo Thinkpad L412 laptop running Windows 7. When waking up from hibernation the system resumed relatively fast, but then, for a minute or two after resuming, many applications (e.g. Explorer, Firefox) would be "not responding". 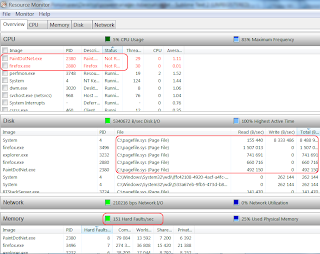 During this period the disk activity was unexpectedly high, Resource Monitor indicated that most of it was paging (see the high "Hard faults" figure, and the c:\pagefile.sys requests on the screenshot), even though there was more than enough RAM available before hibernating. 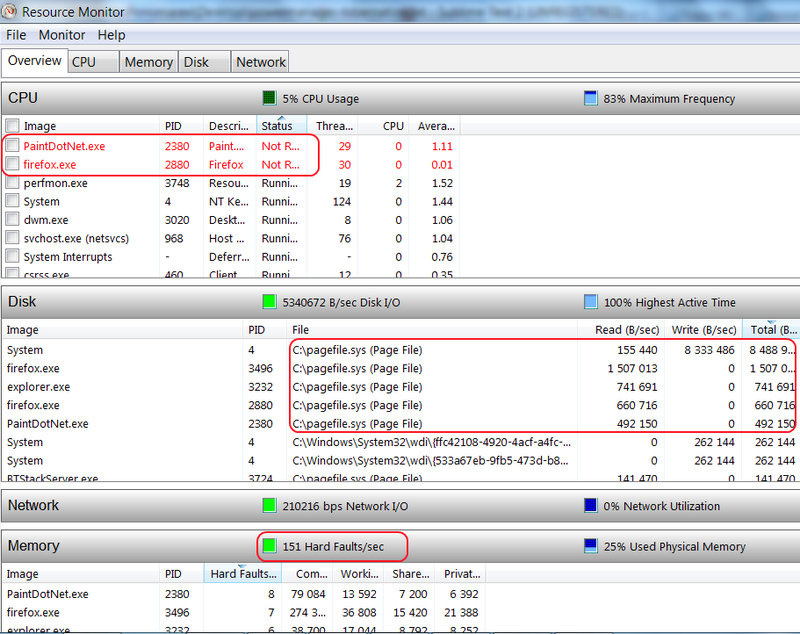 The task manager also showed a drop in memory utilization -- the system used fewer memory after hibernating and resuming than before. "ThinkVantage Technologies Power Manager 6"
Troubleshooting tips that helped to identify the issue can be found here: Trace Windows 7 boot/shutdown/hibernate/standby/resume issues. Nice find! I had just created the same hibernate log when I happened to add thinkpad to my google search and found your very helpful post. Totally solved my slow hibernate issue! I was waiting several minutes before I could use the pc, just resumed hibernate and firefox was totally responsive right at resume. Thanks again!! Sounds interesting, but does anyone have a tip on how to actually uninstall Power Manager? It's not listed in "Add/Remove Programs". I think it was there for me, since I didn't care to mention the exact steps. http://support.lenovo.com/en_US/downloads/detail.page?LegacyDocID=MIGR-70601#uninstall also says it should be there. Thanks for responding! I can see the "ThinkPad Power Management Driver" there, but I read elsewhere (http://forums.lenovo.com/t5/ThinkVantage-Technologies/Disable-Power-Manager/td-p/244772) that one should specifically not remove the driver, only the utility. Perhaps that was wrong - I guess I can just go ahead and uninstall that one and see what happens. 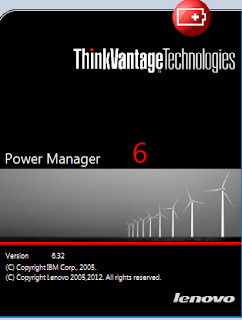 I uninstalled the driver and nothing happened, but then I noticed that there is a program called only "Power Manager". Uninstalling that removed the right program. It was not listed under "ThinkVantage". Without the driver, seems to reboot fine and Windows power management seems to work still. and i couldn't use anything from the loaded session. Now I can work right away :) like it's supposed to be. THANK YOU for nerve and time saving. Thank you for this. I have a Thinkpad with 16GB of RAM, and yet when I resumed from hibernation the hard drive would always churn for at least ten minutes before I could actually use the system again. After uninstalling this software, hibernation/resume is now working as expected. Thanks for this. I have a G780 - it often takes 2-3 hard reboots to get the wifi to restart after a resume - which amazingly is a common problem across the entire lenovo range! I hope removing the power management software (and anything driver related that's not the MS standard) fixes it, because the next step is an RMA and refund. It really is amazing to me that Lenovo have this fault repeatedly reported and they haven't even investigated it yet. It's the last time I buy anything from that company. You've just saved my notebook :-) After waiting 7 (seven) minutes today with frozen apps and hyperactive HDD I decided to smash it... But then I found your post, removed Power Manager and.... computer is up and running in less than a minute. BTW thanks for pointing out the issue my thinkpad no resume is quick again. I was struggling with this bug for a long time. I've started a dialog with Lenovo about this on their forums to draw attention to the problem in the hopes that they can address it. Personally, I like Power Manager, as it has several features that Windows power management doesn't, e.g., battery charge thresholds. It would be helpful if some people here could go to the forums and mention that they have the same problem, since the Lenovo representative says he has not heard of this happening before. Thanks for the registry fix! I will give it a try. I am also experiencing multiple problems which manifest themselves after restoring my T420 from hibernation, including: unresponsive programs, fingerprint SW also takes forever to load, the same (sometimes) for USB ports (mouse or flashdrive starts working after several minutes), OSD for brightness and volume does not appear, sometimes brightness is impossible to change via any means, and WiFi turns itself off or even the whole device needs to be restarted (using PROSet). After uninstalling Power Manager, most of this is resolved. You saved my day buddy! I tried almost everything... uninstalled all the resource hogging apps still no luck... your solution was spot on! Mozilla is my hobby since 2003. I contributed to several extensions, wrote developer documentation first on mozillazine, then on MDC, fixed a few bugs, and then I got a day job.